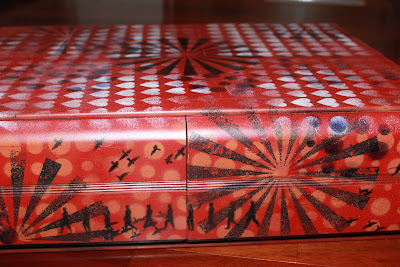 Retro Café Art Gallery: Stenciled Box Make-Over and Some Stenciling Tips! Stenciled Box Make-Over and Some Stenciling Tips! So, in just over a week, Coffee Break Design and Retro Cafe Art Gallery will be vending at the Indianapolis Heirloom Stamping and Paper Arts Festival! 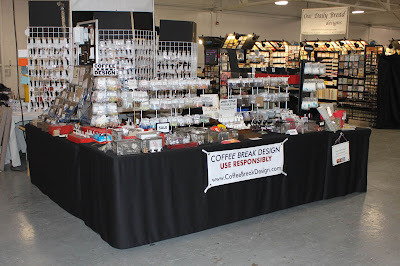 Show prep is well under way, and one of my favorite parts is creating the displays and art samples. I desperately needed something to put under my cash register so that I could operate it while standing and not killing my back! Something to raise it up a bit. 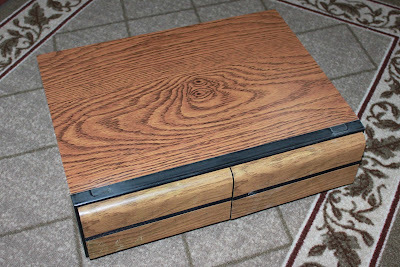 I almost bought an overpriced faux wood box from Meijer, but I hesitated. It was just a box, and I really wanted drawers. I'm so glad I waited! Instead, I went to my local Goodwill store and scored this (ugly) but awesome piece. It's actually a VHS holder! VHS what? Yes, it's hideous, but it was only $2.99 and I saw the potential. Not to mention it was the perfect size and exactly what I envisioned for my register. 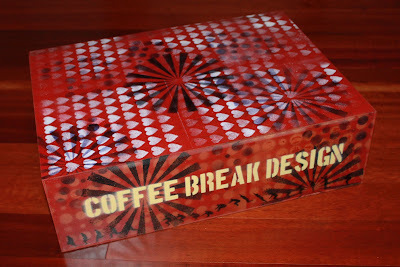 All it took was some spray paint and Coffee Break Design Stencils, and voila! 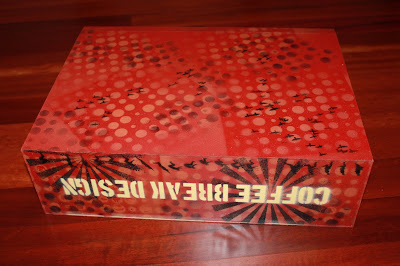 To create the box, I simply used spray paint to spray on a base coat of red paint (outside of course). And then I went to town with the Stencils. I really didn't bother masking them of, however if you want a nice clean look, you can tape them down using wide painters tape. This will protect the area you aren't currently spraying. Or you can do what I did and lay scrap paper around the edges. 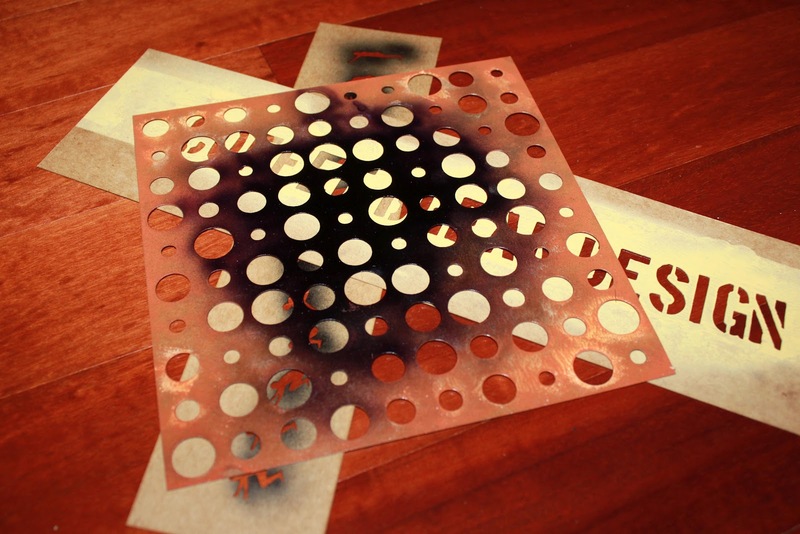 Our Stencils are made from durable stencil oil board, so you can use them over and over again. People have asked me how to clean them, and the answer is don't. Yes, they will get paint on them, but it won't hurt anything. In some ways the paint helps protect them even more. I've had some of the same stencils for years, however when and if they become unusable (haven't encountered this yet) you can use your awesome painted stencils in a journal spread or collage. They are very affordable (some as low as $1.50) so you can always buy lots more! 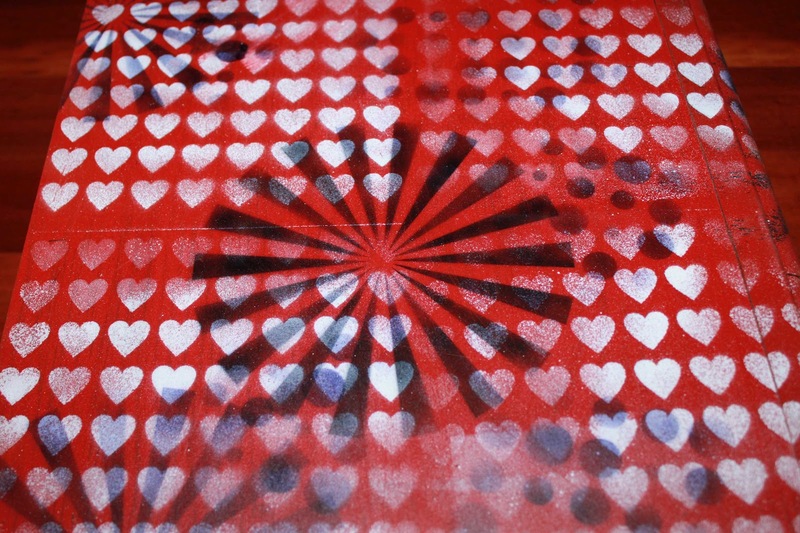 The other thing I love to do, is right after I have sprayed my Stencils, while the paint is still wet, flip them over onto a piece of scrap paper, or directly onto your journal or collage. It helps remove some of the excess paint, plus, you get awesome papers to use in a later project! Stencils are super fun to layer! Since spray paint is so opaque, it really doesn't matter whether you layer light to dark or dark to light. Of course our stencils also work great with markers, pens, stencil paint & brushes, ink & color dusters, airbrush systems, spray inks, and so much more. If you are using really wet mediums, such as our Varitone Ink (basically like spraying on water) you can seal them first with a spray acrylic sealer. Of course if they are already covered in spray paint, they should be pretty well sealed. The purple layer was done using Copic Markers and a Copic Airbrush system. That is why it's semi-translucent, unlike the spray painted areas. To finish and protect the box, I sprayed the entire thing with a matte acrylic sealer at the very end. Even though no one will see it, I couldn't resist spraying the bottom too. It was just so FUN! 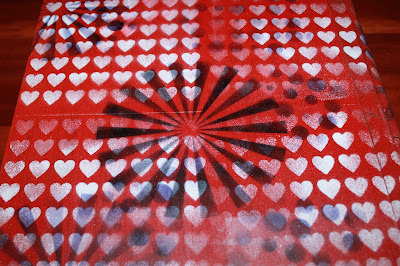 The Stencils I used for this project included: Large Optical, Muy-Walk, Muy-Run, Muy-Jump, Large Flock, Large Onomotoholes, and the Large Heart Background. Could this have been a more perfect fit? There is even a drawer for my credit card machine and another for storing receipts! I love it when things work out. Checking people out will be so much more fun now! How about a little Stencil Giveaway? 1. 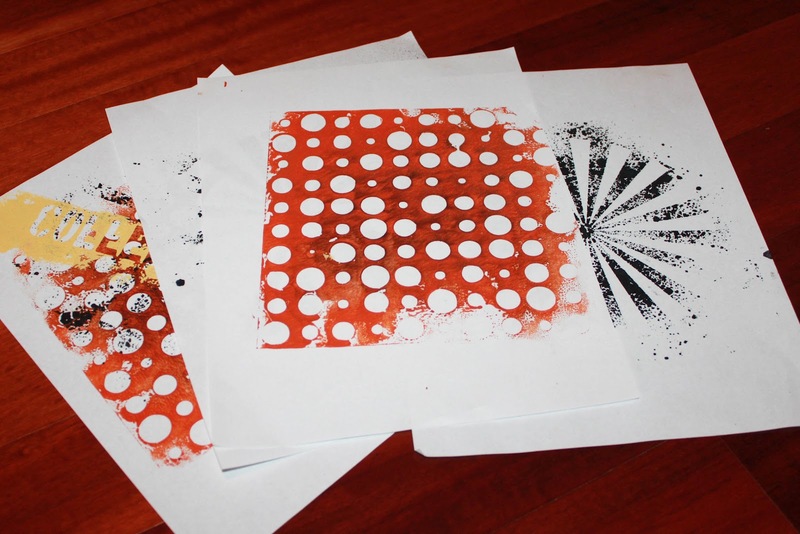 Leave a comment on THIS post and let me know how you like to use your Stencils. If you don't have any, tell me how you would like to use them if you had some! 2. On Wednesday March 7th (the day after my birthday! ), I'll use a random number generator to select a winner to receive a 5 Pack of Coffee Break Design Stencils! Winners for the Egg Shrine Kits will be announced on the same day. Be sure you are entered! I do not currently own any stencils. But I would use them to make Jewelry pendents, cards, and lots of other things I can/will think up. I have yet to try your stencils, but they would be fantastic for art journaling! Your project is really lovely, I love the depth you achieved with all the layers! I HAVE A FEW STENCILS...I USED THEM TO MAKE CARDS. i think I'd like to use them with fabric paints on tote bags or pillow covers! 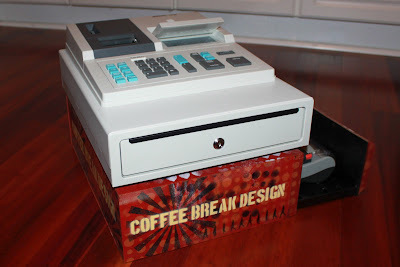 love your "VHS "register box! i have a similar box in the garage!..yep..had a couple of them!! What a FANTASTIC idea! I'd like to stencil on my paper projects (cards & scrap pages) and one day I want to try stenciling some pillows. I don't have any stencils, but have wanted to try some for some time--what is there you couldn't use them for? Everything needs a background and stencils would be wonderful for that! I have been a fan on Facebook for quite some time. Oh, wow! How gorgeous is that? 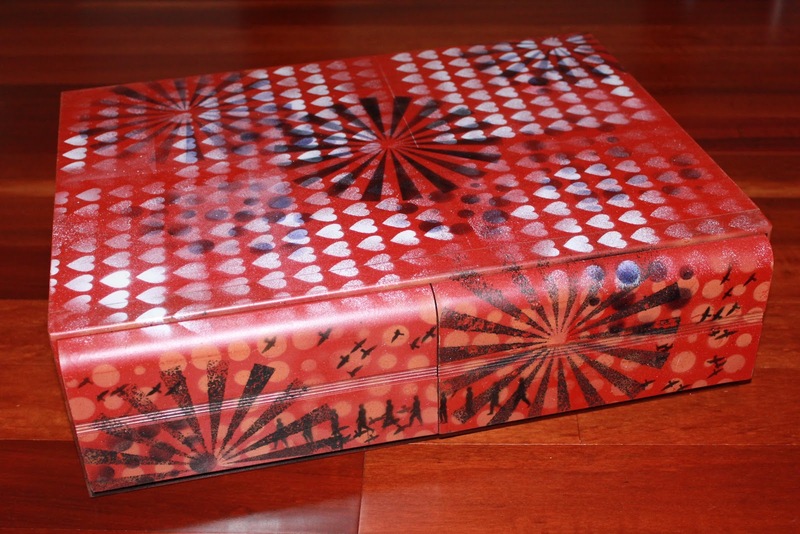 I am working right now on a papier mache book box and I sure could use some stencils! Love your stuff and just recently placed an order! This is a wonderfully altered VHS box, you did a great job. My husband and I are absolutely addicted to Goodwill. You know the Heirloom show in Indy is the same day as the half price day at Goodwill, hmmmm wonder which one I'll attend..:) I love stencils and alter my own projects. I like them for masking purposes mostly on paper items. You can use anything from spray paint to misters. Sorry so long, see you in March! I would love to win, currently I don't own any stenciles,but would find all kinds of thongs to use them for. I just got a few of your stencils, but yet to use them. I'm thinking I'll start with journal pages. I can't wait. Been following you on Facebook for a while too. I love your stencils! I just used some lovely hearts on my latest assemblage. It is beautiful, currently residing in Scott Wannberg's Memorial Library at Beyond Baroque in Venice, CA. Everyone loves the hearts! I do not have any stencils! I would like to put some on a wall! I am a Facebook Fan.....It was the Stencils that got me Hooked!!!!!! 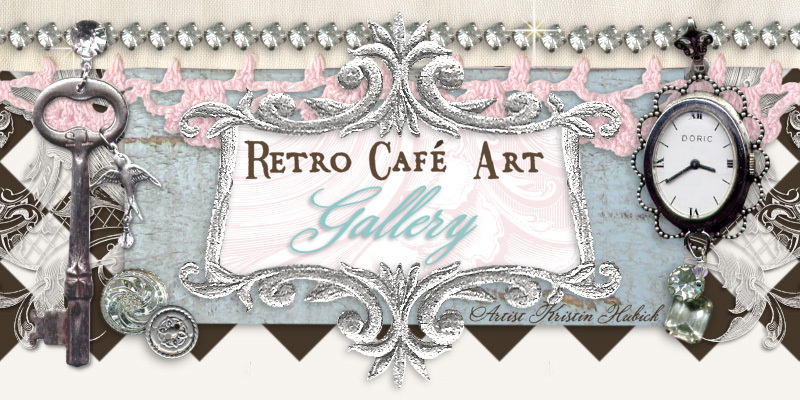 Yes I'm a longtime fan of Retro Cafe Art Gallery and customer...love your stencils and your clip art...lovely ladies! Fan on FB and follow here.... Awesome box for your register!! Loving your register box, wow. I am a facebook fan and may see you at the show! I use my stencils on mixed media canvases and in my art journal. have been following you since i purchased the shrine parts from you. i would really enjoy using the stencils to enhance more of these beauties..
i haven't tried your stencils - yet! - but i have used stencils in some of my artwork. i'd love to start collecting some of yours! stencils would be great for notebook altering! Great new life for that old VHS box! I don't have any stencils, but I would like to try stenciling on Tee-shirts with my kids. I have a few colors of fabric paint and am waiting for some Yudo brand silk screen inks/paint to arrive. It is a set of 3 Primary colors that we can mix and experiment with...hope it will work! Happy Birthday (a bit early)! I love to use my stencils with Color Wash and then gesso over them so that you get a nice ghosting effect then of course more Color Wash. Loved meeting you at the Heirloom Show in Indy this past weekend. I use my stencils with Dy-Na-Flow for sun dyeing fabrics and for up cycling found things. Love them!!! I don't have any yet. I just learned about you. I will use your stencils in art journaling.